I spend a ridiculous percentage of my life smiling, and I really, really, hope the same is true for you. But maybe, if it’s not, could it be because you’re not in love with your smile? A bright white smile gives me the confidence to flash my pearly whites excessively. Which is most likely to blame for my teeth whitening addiction. For as long as I can remember, I’ve been using Crest White Strips every other week. Whether it was before a big audition or just for a dinner date with my husband – having a white smile is the one constant in my life that has made me nearly instantaneously feel put together. But a few months ago, when I was in Utah filming Hallmark’s “Christmas Made to Order,” I made a terrible mistake: I slept in my Crest White Strips. I just had to have whiter than white teeth, and I have this stubborn greyish tooth on my bottom row that never gets as white as its neighbors. This particular tooth is not only chipped – it’s set back from the row, so the strip never sat on it correctly, leaving it still stained from my coffee, tea & red wine obsession (girls gotta live). Anyways, fell asleep with them in – woke up to out of this world sensitive teeth. So sensitive that I couldn’t breathe with my mouth open. So sensitive that even drinking room temp water bothered them. I vowed to never use strips again, and cursed myself ALL WEEK LONG while I winced every time I ate or drank… or breathed. You see, I have always had an adverse reaction to whitening. One time I got Zoom for my wedding and cried the entire time. Like full ugly tears at the dentist, causing the treatment to be cut short. And every time I used the strips, my teeth would ache from the sensitivity. I thought it was just a small price to pay to have the confidence that came with my stark white teeth. ….but after this Utah whitening disaster, I couldn’t bring myself to whiten again with strips. 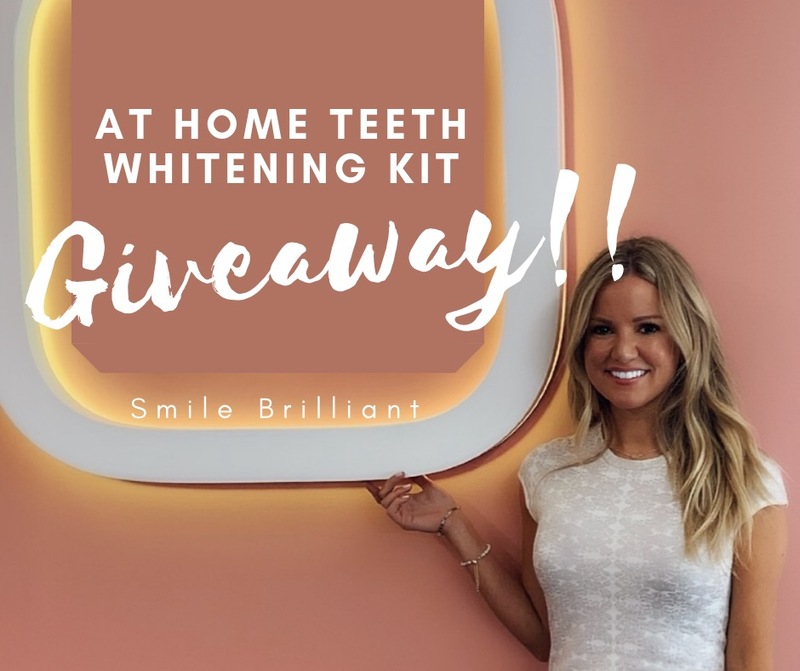 So when my teeth started to stain up a month later, I researched alternative whitening kits and found Smile Brilliant – a custom tray whitening system with anti-sensitivity gel. HALLELUJAH! The kit came pronto, and while it looked a little like a science project, it was easier than pie (what is it about pie that’s easy anyways? I mean homemade crust is borderline impossible). Mix the two puttys together, press into the tray setter, gently bite down, wait a minute, pop it out. Repeat for bottom teeth and send it back to Smile Brilliant. 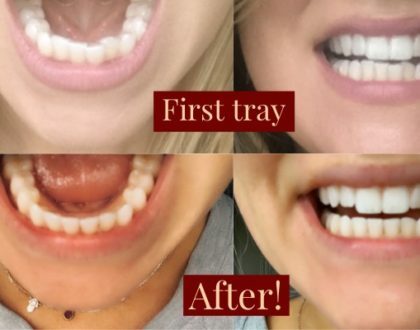 A few days later and your custom plastic trays show up at your front door. You use the sensitivity gel, then the whitening gel, wear for 45 min – 3 hours, and reveal movie-star white teeth without ANY sensitivity. I’m hooked.